Guitar players often ask me what makes pentatonic scale patterns major or minor. The answer is that the pentatonic scale is either major or minor depending on which note is functioning as the tonic, which means primary pitch (called root when dealing with a chord). The tonic is determined by what you’re playing over. For example, the songs “My Girl” by The Temptations and “Breakdown” by Tom Petty both use the same scale. It’s the C major/A minor pentatonic scale, which consists of the notes C-D-E-G-A or A-C-D-E-G depending on whether you start on C or A. In “My Girl” by The Temptations, the primary chord in the progression is C major and the primary note (or tonic) in the pentatonic scale riff is C, so you call it C major pentatonic. In “Breakdown” by Tom Petty, the primary chord in the progression is Am and the tonic note in the pentatonic scale riff is A, so you call it A minor pentatonic. The C major and A minor pentatonic scales consist of the very same notes and patterns. The difference is which note is functioning as the tonic (primary pitch). You see the same pentatonic notes and pattern in these diagrams. In the first diagram, you see where the C note and C chord tones are located in the pattern. You see where the A note and A minor chord tones are located in the second pattern. This is just pentatonic pattern 1, but all related pentatonic patterns that connect to pattern 1 are also either C major or A minor. If C is the tonic, meaning that tonally everything revolves around and resolves on C, then you call the scale C major pentatonic. If A is the tonic, meaning that tonally everything revolves around and resolves on A, then you call the scale A minor pentatonic. When C is the tonic, then the other scale notes are major intervals in relation to C. Specifically they are root, 2nd, major 3rd, 5th, 6th. When A is the tonic, then the scale’s structure changes because all the scale notes are thought of in relation to A. In this case, the scale formula is root, minor 3rd, 4th, 5th, b7th. Every pentatonic key can have one of two possible tonalities. The tonalities are called “relative major” and “relative minor”. C and Am are relative. So are G and Em, A and F#m, D and Bm, F and Dm, etc. 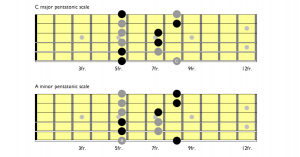 In pentatonic scale pattern one (as I teach it in my Fretboard Theory guitar theory program) the first note is always the relative minor and the second note is always the relative major no matter what key or position you’re in. I just started going through the Fretboard Theory book and I’m enjoying it quite a bit. Thanks for this explanation on major vs. minor. My understanding is that, it boils down to what interval sequence you take to resolve back to whatever the root note is for the key your currently playing in. The route you take to get to the root is irrelevant. It’s the root itself that determines if a pentatonic scale is major or minor. But the interval structure around the root is what makes it major or minor. I purchased Desi’s 4 DVD set and Fretboard Theory book and have been working through the Pentatonic DVD along with the book. Desi’s products and clear explanation given me a whole new understanding and playing ability. I have never gained so much ground with such little effort. Thank you for unlocking the fretboard with your clear explanation of theory. TWait, I’m a bit confused. I’ve been learning C major, and Am pentatonic from a scale book, but they both are shown as starting on the same root notes. They both start on the 5th fret, the A, so all I have to do, is start on the C (8th fret) as opposed to the A (5th fret), and I’ll have C major pentatonic? Or will that result in Cm pentatonic? Yes, you’re correct that the pentatonic scale pattern that starts at the 5th fret, usually called pattern one, is both A minor and C major. The first note in the pattern is the minor root (better known as the “tonic’ in music) and the second note in the pattern is the minor root. This remains true no matter where you position the pattern and what key you play in. C minor pentatonic is played by placing your first finger on C at the 8th fret of the 6th string and then playing the first pentatonic pattern. C minor pentatonic is also Eb major pentatonic. More important than where you start in the scale pattern is what you play the pattern over. Playing A minor pentatonic over an Am chord or progression that centers on Am will sound like A minor no matter where you start, even on C. Likewise, playing the same notes over a C chord or progression that centers on C will produce a C major sound even if you start on A. It would probably help to learn the pentatonic scale patterns on guitar first. 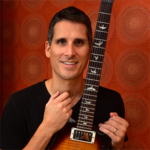 See my DVD, Getting Started with the Pentatonic Scale and/or my book, Fretboard Theory. C major and A minor pentatonic use the very same notes and form the very same patterns, so the answer to your question is yes. Keep in mind that when you play the scale over a piece of music in the key of C, then the scale is not really A minor, it’s C major. 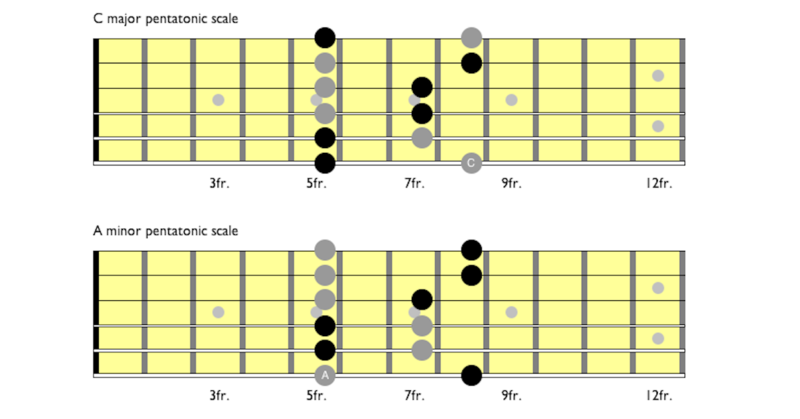 Likewise, the same scale is A minor when played over music in the key of A minor. The primary note in the scale is determined by the primary pitch of the music you play over, not what you call the scale or think of it as being. When playing in the key of C, the C note in the scale sounds like the primary pitch and the A note sounds like a 6th. When playing in the key of A minor the A note in the scale sounds like the primary pitch and the C note sounds like a b3rd. First of all, I cannot read music. I’m self taught and can only play by ear. Talents and capabilities are limited ! Your explanation above goes some distance for someone brought up on the 7 notes scale and the 5 notes scale is still a big problem for someone like me. Don’t quite understand or appreciate it (sorry). Question – can I learn all these without reading music notes ? I’ve seen many instruction books in the shops but they all have the classical notations. So, it’s a no go for me. I only play for myself and am not planning to go professional ! Whether you play professionally or only for yourself, the more you learn about music the more you will get out of it. Most guitar players read tablature or “tab”, which is very simple and takes only a minute to learn. Google “how to read guitar tab” and I’m sure you’ll find several free lessons. I provide guitar tab and neck diagrams throughout all of the books and videos I sell. It is not necessary to read standard musical notation (or “classical” as you call it) to follow my lessons. I bought this course but didn’t get around to watching any of the videos for a few months. When i did, I started with the video and chapter of the book relating to the major scale. After watching and trying to follow along in the book for about 10 minutes, it was finally revealed that major position #1 in the video was actually major position #2 in the book. i spent 10 minutes not knowing what the hell was going on and i don’t have much confidence going forward that these situations will not come up again. I hope this situation does not turn out to be a frequent issue. If i was within the deadline, i would return the videos. Sorry for the confusion, Joel. You’re welcome to request a refund anytime, but I suggest you keeping working through the program because I think you’ll get the results you’re looking for. I do present things a little differently in the videos compared to the books, when I think added perspective is useful. I also show you how to play three-note-per-string major scale patterns in the video, which are not included in the book. In fact, the videos go into more depth overall.